St Andrew’s Church exemplifies the quintessential village Church set amidst glorious countryside in the Kenn valley, and is surrounded by an ancient graveyard which is ‘a picture’, carpeted in the Spring with primroses, snowdrops and daffodils. The graveyard also contains an ancient yew tree. 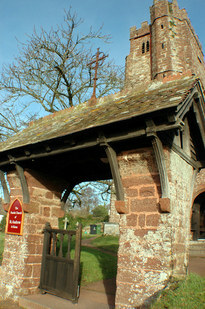 The Church is built of red ‘Heavitree’ sandstone. There is evidence of Norman origins but re-building was carried out in the Thirteenth Century and further enlargements in the Fifteenth Century. Much internal refurbishment and re-ordering was carried out by the ‘Tractarian’ Rector, the Rev’d R. Porter, in the latter part of the Nineteenth Century. A prominent feature of the interior is the very fine screen dated at about 1500 A.D. The screen tracery is Perpendicular in style and the spaces at the bottom are filled with forty one panels painted with male and female saints. On top of the screen stands the Rood (Crucifix) which was carved in Oberammergau in 1885. This Rood replaced an original which would have been removed by law during the second half of the Sixteenth Century, and was the first Rood to be replaced in Devon . Great emphasis is placed upon the altar. The Reredos, (the screen at the back of an altar), and the gilded mosaic panels on either side, presents a very striking and colourful appearance. The oldest object in the Church is the Norman font, made of Purbeck marble.